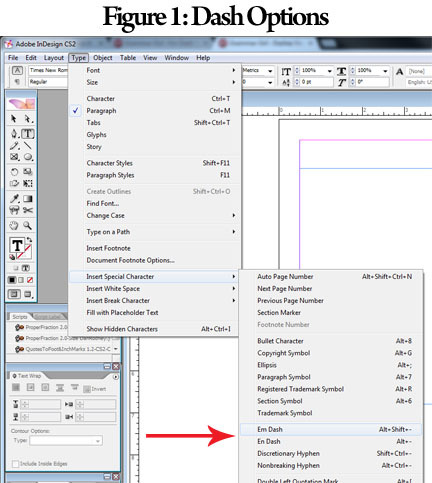 When using software such as Adobe InDesign, you may notice the option to include Em or En dashes (fig. 1). These dashes serve different purposes. Historically, the en dash was the width of a capital N (thus the name). The en dash is used when relating to periods of time. For example, the “2013–2014 school year,” and when connecting open compounds. Historically, the em dash was the width of a capital M in the typeface and is about twice as wide as the en dash. As with the en dash, the name of the em dash comes from the letter it is connected to. Most of the time someone uses a dash, they are using an em dash, or at least should be. It can potentially be used to add emphasis, indicate an interruption, or show a sudden change in thought. Just as a point of clarification, a hyphen is a completely different symbol altogether.